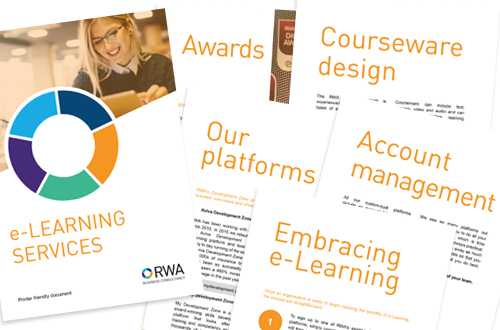 RWA has been developing market-leading e-Learning platforms and courses for over ten years. During that time, the technical and content teams at RWA have continually broken new ground in learning management system (LMS) design, functionality, engagement and course content. RWA e-Learning has produced some of the very best online learning platforms and content in the market, including the Aviva Development Zone, My Development Zone and Trade & Export Online. Click one of the links below to request a free trial. The team also offers a standalone course design service. If you would like an e-Learning module for your website or intranet, our complete end-to-end service will support you throughout the process, from design and authoring to implementation and launch strategies. We have considerable experience of course design and have produced numerous standalone modules which are being used by high-profile brands such as the Welsh Language Commission, Welsh Rugby Union, FA Wales and Welsh Cricket. Get to grips with the IDD with the support of the Aviva Development Zone.